Halloween can be the perfect time to feature fabulous bohemian gothic accents in your wedding. The easiest way to keep it trendy, is with subtle additions. 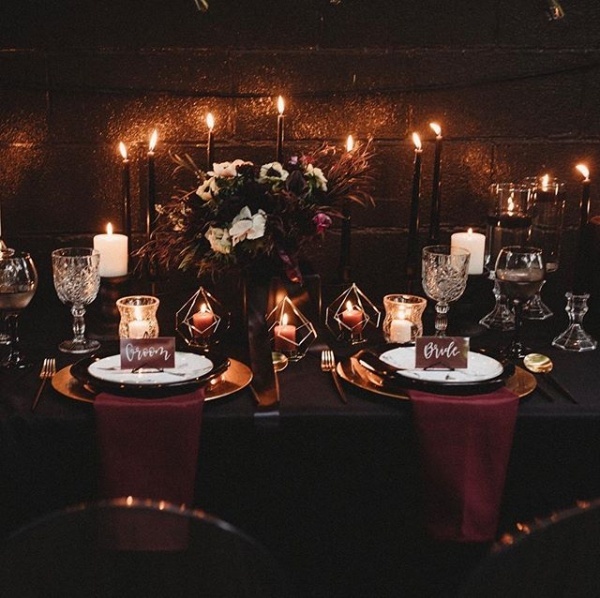 We’ve chosen 5 different ways to add gothic accents into your own wedding day celebration. Your attire can feature a gorgeous black wedding dress or even coordinating black ensembles! We especially like showcasing a table setting with a dark toned color palette and long candles for a moody romantic effect. Or perhaps try adding some props like colored smoke or crescent moon backdrops for a magical look? We also suggest adding subtle bohemian touches to your wedding with flowers on a dark black toned cake or even bridesmaids dresses with lace and textures. Have fun and embrace your dark side!